For the last few years, my family and I have been trying our best to make the greener choice when we have an option. 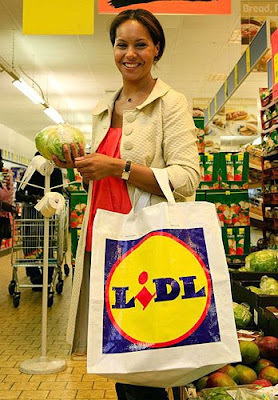 In 2005 we started using the large woven-style grocery totes that are now becoming more and more popular in large markets. This was not because we initially wanted to use less plastic grocery sacks, but because omce we trued them, we realized we could make fewer trips to the car when using a few large bags (instead of 20 plastic sacks rolling around in the back seat.) These products simply made more sense, both practically and environmentally. We havent used a plastic grocery sack by choice in over three years. When it makes sense to use recycled, renewable, or environmentally friendly products, why not use them? It's a real no-brainer when the price is right and the product quality is on par (or better in most cases) than you would experiece with a traditional, non-environmentally-friendly option. Here's a new example of renewable bamboo fiber making its way into our little niche, the ID accessory market. 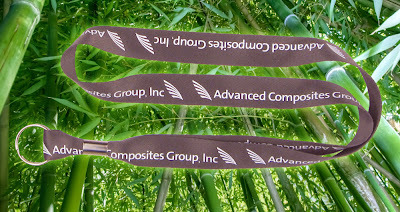 CredentialExpress now manufactures a line of lanyards made from bamboo fabric that is also impregnated with an activated charcoal. This not only illustrates a shift from plastics to renewable in the fabrics, but it also yields possible benefits to the user's health. The activated charcoal in the fabric has been said to remove toxins from the wearer's body, albeit in small amounts. It may seem like a too small of a device to matter but when it comes to health improvement, every little bit helps. The bamboo fiber lanyard is noticeably softer and more pliable than any other material I have seen used for this type of ID accessory product. It is very flexible, but doesnt stretch out like polyester or elasticized fabrics. It looks great, feels great, takes an imprinted image very well, and makes less of an impact on the environment. It seems like a good logical alternative to plastics-based fabrics. We're excited about the possibility of the average user's level of interest in renewable lanyards. More and more, I am trying to make the conscious decision to pick the renewable or recycled option in my daily purchases and habits. If we all made a small change, we would all see a large collective effect and realize the benefits of smarter resource management. Next time you have an alternative, why not make the renewable choice? 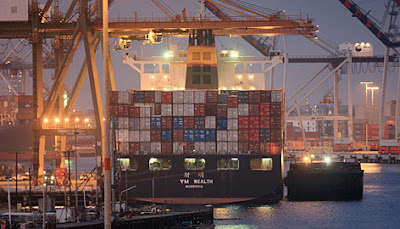 WASHINGTON — A six-year, $250 million anti-terrorism effort to secure the nation's ports is delayed for at least two more years because the government lacks machines to read fingerprint ID cards issued to more than 1 million workers. Truckers, deckhands and others requiring access to secure areas at ports paid $132 apiece for the high-tech ID cards that have their fingerprints embedded in them. But the Homeland Security Department, which is overseeing the program, says it still lacks fingerprint readers that can be used reliably in harsh weather. Maurine Fanguy, head of the ID program, said the cards improve security even without the fingerprint scanners, because they are issued after workers' criminal history and immigration status are checked. The cards, which have holograms and microprinting that can be read only with magnification, are hard to forge, Fanguy said. Port workers previously used driver's licenses or port ID cards. We say: Many ports have completed or nearly completed initial card issuance. 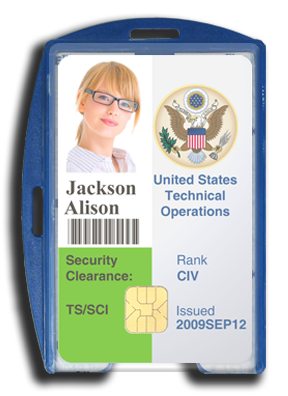 Our SkimSAFE badge holders are a vital component is keeping the stored card information safe and secure. It's great to have a product that generates trade show buzz. That was the case last week with our SkimSAFE badge holders at ISC-West. We had a number of visitors dropping by to discuss this product line. SkimSAFE is a FIPS-201 approved electromagnetically opaque sleeve that protects your encoded data from hacking and skimming. More and more government agencies & defense contractors are agreeing that the functionality, light weight, and elegant design make it the best product on the market. As usual, dealer inquiries are welcome. BlackBerry manufacturer chooses Laminex ID Accessories! If it's good enough for RIM, it's got to be a great product! The maker of BlackBerry, Research In Motion has recently chosen the LanyardReel from Laminex as their employee badge holder. The product combines a super-comfortable lanyard with the benefit of a retractable 30" reel. Laminex offers customization on the reel and the lanyard, for your corporate brand or logo. As long-time BlackBerry users, our staff was thrilled with RIM's choice. See more great ID accessories from Laminex in our online catalog or web site, and read more about RIM's innovative handheld devices here.